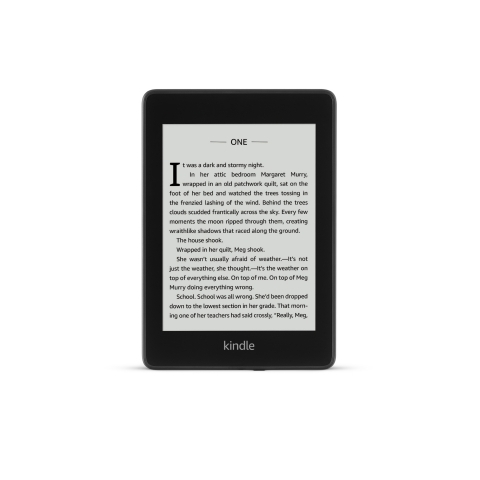 SEATTLE--(BUSINESS WIRE)--(NASDAQ: AMZN)— Today, Amazon introduced the all-new reimagined Kindle Paperwhite, featuring a thinner and lighter design, sleek flush-front display, and waterproofing so you can read comfortably anywhere. It also comes with Audible so you can switch seamlessly between reading and listening to professionally narrated performances from the world’s largest selection of audiobooks. For a limited time, you get six months of Kindle Unlimited for free, a $60 value, so you can read as much as you want from a selection of millions of titles. And with so much great content, the all-new Kindle Paperwhite comes with twice the storage so you can hold more large files like audiobooks, magazines, newspapers, and comics. The all-new Kindle Paperwhite still includes features customers love about Kindle like a glare-free display and a battery life measured in weeks. The all-new Kindle Paperwhite is available for pre-order today for just $129.99 at www.amazon.com/kindlepaperwhite and will start shipping November 7. The most popular Kindle is now waterproof so you can read in even more places. The all-new Kindle Paperwhite is designed to withstand accidental drops in the bathtub, hot tub, pool, and ocean. It’s IPX8 rated to protect against immersion in up to two meters of fresh water for up to 60 minutes. The all-new Kindle Paperwhite comes with twice the storage so you can keep more content on your device. Available in 8 GB, which is twice the storage as the previous generation and can hold thousands of titles, and 32 GB for storing even more content with large file sizes, like audiobooks, comics, newspapers, magazines, and more. With Bluetooth built-in, listen to your favorite Audible book and switch seamlessly between reading and listening so you never lose your place. Access the Audible store directly on the all-new Kindle Paperwhite and find your next listen from the world’s largest library of audiobooks—including more than 450,000 professionally performed audio programs, including Audible books, original audio productions, and exclusive content. Just connect your all-new Kindle Paperwhite to a Bluetooth-enabled device, like speakers or headphones, and dive into a story. Kindle devices already come with instant access to millions of titles in the Kindle Store. Now, for a limited time, you also get six months of Kindle Unlimited for free so you can read as much as you want at no additional cost across millions of titles, including popular books like Norse Mythology by Neil Gaiman and Beneath a Scarlet Sky by Mark T. Sullivan, as well as works from Terry Pratchett and Michael Lewis. It also includes books that make it to the big screen like Molly’s Game by Molly Bloom. After six months, Kindle Unlimited is just $9.99 per month. Whispersync and Whispersync for Voice—Saves and synchronizes your last page read, bookmarks, and annotations from your Kindle eBooks and Audible books across all of your Kindle devices and apps, so you can always pick up where you left off on any device, whether you’re reading or listening. World’s best selection—Millions of books, newspapers and magazines, including the latest best sellers, and programs like Prime Reading and Kindle Unlimited, both of which continue to grow. Kindle exclusives—Over one million books are exclusive to the Kindle Store. Amazon First Reads—Early access to an editorially curated list of six new books one month before they officially publish. Every month, customers can choose one Kindle book from our editors’ picks for $1.99—Prime members get it for free—and also purchase hardcovers for $9.99 or less. The all-new Kindle Paperwhite is $129.99 for the 8 GB model and $159.99 for the 32 GB model. The 32 GB with free cellular connectivity is $249.99. All are available today for pre-order in the United States. Customers can also purchase a cover with a thin design that snaps perfectly onto the all-new Kindle Paperwhite. The cover opens like a book, automatically waking the device when opened and putting it to sleep when closed. Choose from three materials in a variety of colors: a premium leather cover for $59 in rustic; leather covers, all $39, in black, merlot, punch red, and indigo purple; and water-safe fabric covers, all $29, in charcoal black, canary yellow, and marine blue. Customers can learn more at www.amazon.com/kindlepaperwhite.